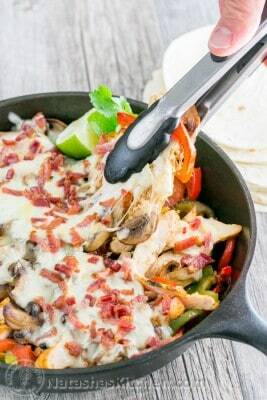 When my husband worked at Chilis Restaurant, he learned how to make these Mushroom Jack Fajitas. This recipe is less salty which we prefer. They're so satisfying and pretty simple to make. Combine marinade ingredients in a medium bowl. Slice chicken in half lengthwise so you end up with about 1/2" thick chicken cutlets. Add chicken to marinade and stir until evenly coated. Cover with plastic wrap and refrigerate 45 min to 1 hour, stirring midway. To Saute Chicken: Heat a large non-stick (cast iron is best - it should be oven safe) skillet over medium heat. Saute chicken with 1-2 Tbsp oil in a single layer, until browned on each side and cooked through (3 min per side). Slice chicken into 1/4" thick strips and place over the cooked vegetables. Top with sauteed mushrooms, then cheese and finally crumbled bacon. Place under the broiler in the upper third of the oven for 2-3 minutes or just until cheese is nicely melted.